Before the age of safety matches, matchbooks, and lighters, was the age of delicately intricate or simply functional matchsafes. Known as ‘vesta cases’ in Britain for their association with Vesta, the Roman goddess of fire and the hearth, matchsafes reigned as king when early friction matches were considered highly combustible and unreliable. To avoid the rather uncomfortable experience of having them spontaneously light in one’s pocket, this special container that remained closed at all times was intended to reduce extra friction to avoid that occurrence. While designed for many purposes that range from kitchen matchsafes or matchsafes meant to sit on top of a desk, the most common type were those produced specifically to carry in a pocket. They came in the largest variety of forms imaginable, from simple rectangular forms to shoes, boats, dragons, or anything else the mind can create. 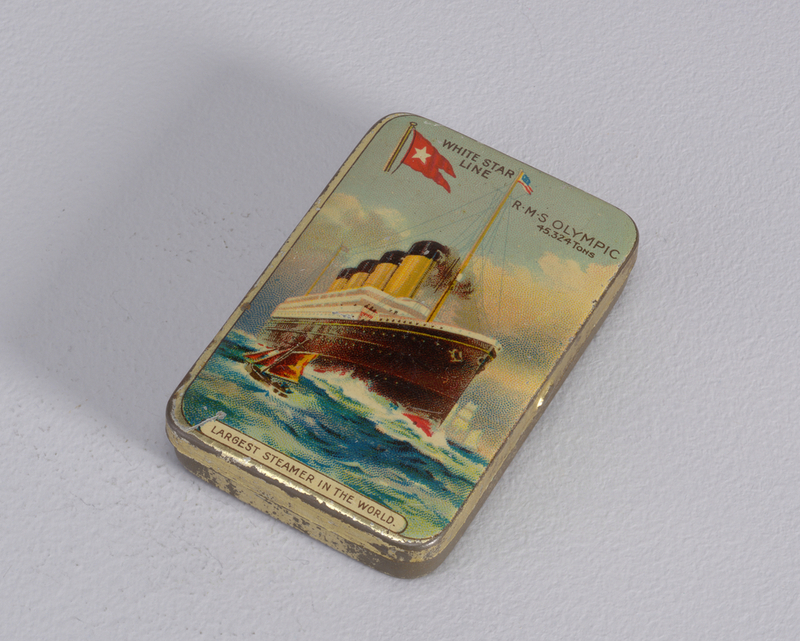 Similar to the pocket matchbooks of today, they also functioned as advertisements for manufacturers, featuring logos or quirky catchphrases. These matchsafes were some of the most common types produced from 1900 to 1920, inexpensively made of plated metal with a stamped or printed design. From lawn mowers to cafes to shipping companies, everyone used matchsafes as a cheap way to promote their products or services. This particular matchsafe was designed as an advertisement for the R.M.S. Olympic, a transatlantic ocean liner for the White Star Line. The White Star Line is most famous for the Oceanic vessel of 1870, and most tragically remembered for the ill-fated voyage of the R.M.S. Titanic of 1912. Less well-known but just as majestic and impressive was her sister ship, Olympic, with an impressive career spanning 24 years from 1911 to 1935, including service as a troopship during the First World War. Olympic was one of three Olympic-class ocean liners built by the Harland & Wolff shipyard that were designed to be the largest and most luxurious passenger ships in the world. Nearly identical to Titanic, Olympic featured an extravagant Grand Staircase among countless lavish facilities including a swimming pool, Turkish bath, cafes, and restaurants for use by first-class passengers. A dock in Southampton, her port of departure for her maiden voyage, was specially constructed to accommodate the new Olympic-class liners. She was designed by and captained by the same men who would lose their lives on the Titanic a year later – Thomas Andrews and Edward Smith, respectively. Despite multiple collisions with other ships throughout her career, Olympic remained the face of the White Star Line until she met her own deadly enemy – the Great Depression. Withdrawing from transatlantic service in 1935, she was then eventually sold for scrap metal. During her career, Olympic had completed 257 round trips across the Atlantic, transporting 430,000 passengers on her commercial voyages, and travelling 1.8 million miles. Matchsafes produced during this period documented the lively mix of goods and services appearing at the time, and function as excellent records of commercial graphic design. This matchsafe featuring the R.M.S. Olympic as the “largest steamer in the world” is only one of thousands that were produced to promote a product or service. They often exploited new materials of the period, as well as traditional ones. Matchsafes solved a simple problem that could have had disastrous results, and in return became a symbol of elegance and fashion. Their study reveals an infinite array of designs as a glimpse into a once-forgotten feature of the past. Erin Benedictson is an Alberta-Smithsonian intern in the Product Design and Decorative Arts Department at Cooper Hewitt, Smithsonian Design Museum. Deborah Sampson Shinn, Matchsafes (London/New York: Scala Publishers (in association with Cooper-Hewitt, National Design Museum Smithsonian Institution), 2001), 9. Mark Chirnside, “The ‘Olympic’ Class Ships”, The History Press (2011), 136-140. Thanks for the comprehensive information. The Olympic background was a very nice touch. Interesting and well written. Brava!